You’ve probably seen knee sleeves before, though you may have not known what they were. Athletes tend to wear them a lot. You will see their knees covered in colorful fabric while they run or lift weights. These aren’t just for style, though athletes do seem to like sleeves that stand out. Knee sleeves are actually a way for them and yourself to protect the body. What Does a Knee Sleeve Do? First of all, a knee sleeve isn’t the same as a knee brace. A knee brace is used after an injury happens. The goal is to prevent further damage. They are also made more sturdy and stiffly compared to knee sleeves. Knee sleeves are usually made with neoprene, which is a flexible fabric that mimics rubber. They are able to bend and twist with the body. It also helps keep the muscles warm which makes them more relaxed. The goal of a knee sleeve is to prevent any injury from happening in the first place. They do this through improving circulation in the knee. Good blood flow helps muscles recover faster, making you feel better during and after an activity. Good blood flow also prevents swelling. It also keeps your patella, your kneecap, in place. Your patella is a very vulnerable bone. By keeping it secure you will prevent injuries and retain better posture. Did you know that your knee is the largest joint in your body? This makes it one of the easiest to injure. When your knee is injured, it really limits your life. If you think about it, the knee is what connects your thighs and calves together. It’s the reason that you are able to move around. You wouldn’t even be able to bend your knees to sit. How many times do you do that without thinking about it? Knee sleeves help prevent these injuries. A usual injury is a fracture. The patella is normally the most common bone broken in the knee. The ends of the femur and tibia can also get fractured. This can happen when weightlifting. Literally, your knee can grind into itself. Not too pleasant to think about, is it? It can take a long time for these injuries to heal and they really limit your movement. These injuries can happen from high energy trauma. This type of trauma is common in sports. There’s also dislocation, when your bones are out of place. This could be a little or significantly out of place. A knee sleeve will keep the bones in place, so this is less likely to happen, though it can’t prevent it completely. This can also happen from high-energy trauma. An example would be landing wrong after a jump or fall. A knee sleeve will compress your knee enough that it will hopefully stay in place. Anterior Cruciate Ligament (ACL) injuries may be the most devastating to athletes. They can permanently bench them and give them problems for the rest of their life. The ACL is the reason that your knee can bend, it connects the patella to the tibia. An ACL tear can come from changing directions quickly or landing from a jump wrong. These types of injuries happen to soccer, football, and basketball players. It can also happen to runners or those who do CrossFit. There are Posterior Cruciate Ligament (PCL) injuries. The PCL is the ligament in the back of your knee. It connects your femur and tibia. The injury is when there’s a blow to the front of the knee while the knee is bent. This can happen in sports and motor vehicle accidents. Collateral Ligament Injuries happen when a force pushes the knee sideways. The ligaments are found on the sides of your knees. These are usually contact injuries that happen during sports. Meniscal tears happen a lot in sports. The meniscus is the cartilage between your knee bones. They act as shock absorbers. Tears can come from twisting, cutting, pivoting, or being tackled. Tendon tears can come from when tendons are stretched too far. These usually happen to middle-aged people who play running or jumping sports. Falls, direct force to the front of knee, and landing awkwardly from a jump can be some of the reasons for a tear. Rocktape is a company that wants to keep athletes healthy and moving. The founder of the company is an athlete himself. All his activities caused him to have knee pain. When he was getting help from his physical therapist, everything changed. It started when his therapist was putting some tape around his leg. He asked if this was the same type of tape that athletes at the Olympics use, which it was. He was surprised by how well the tape helped with his injuries and made moving around easier. He started doing research about the tape, and long story short, Rocktape was born. The company offers a variety of products like tape, knee sleeves, pain relieving gel, hot pain relief, and anything else an athlete needs. They want to be a company that athletes trust and will do anything to keep them safe. They even offer good guarantees. Like you have 12 months with their knee sleeves, this means you can get a new pair if yours falls apart within a year. So now that you know all about what a knee sleeve is and what kind of company Rocktape is. Let’s show you some of the best Rocktape knee sleeves. Actually, they technically only have one style, which they call the Assassins. But these knee sleeves come in a variety of patterns and colors. There’s pink camo, a tropical flower one, black, one with a skull, one that is the American flag, red camo, one with their logo all over it in a newspaper style, and more. They created these knee sleeves through 3 years of research. They listened to the feedback of their customers and athletes like Ashley Horner, Marcus Filly, and Neal Maddox. Using all this info, the Assassins were born. This is actually their third version of this knee sleeve. You have the choice of 5mm or 7mm thickness. 7mm is the standard for most knee sleeves. These provide the most support. The 5mm is used for lesser activities and people who don’t want a tight squeeze. The size range is pretty straight-forward. It ranges from small to extra large. These sleeves are larger than most knee sleeves and designed to handle the toughest workouts. Being longer helps with proper stability and tracking of the knee. It also keeps them in place better. They are sold as a pair which is different than most companies who only sell a single sleeve. They are anatomically designed so they taper downwards, following the curve of your leg. The sleeves made of a synthetic fabric shell bonded to SBR neoprene. They are stitched together with a double-mauser stitching. This keeps the sleeve together for longer. They also have 4-way stretch Lycra side panels to keep them comfortable and flexible. How better to let you know if these really work than looking at the people who use them? It’s easy for companies to get people to say they loved it, but they may have never tried it. People are big fans of these sleeves. Many of the reviewers praise them for being able to support and handle intense workouts. People also love the fact that they don’t roll. This seems to be a common problem in many other sleeves, that and always the need to readjust them. For some people, these sleeves have helped improve their performance. They are able to run farther and do more sets. This seems to be happening for people of all ages. There were a few middle-aged reviewers that were able to do more. They were excited. This is the goal of Rocktape, to give people a chance to do what they love, even if they start to hurt. People also praise Rocktape’s customer service. When anyone had a problem, they were quick to offer assistance. Many people got replacement sleeves within 3 days. Everyone is always surprised by how nice the customer service is. You know it’s good customer service when the people like them to the point that they don’t mind that their original sleeves had a problem in the first place. There have been complaints of them tearing within a few months if you use them 2 or 3 times a week. Though many people have said that those could be the old versions and that the new version was even stronger and more durable. On Amazon, these sleeves have a 4.4 rating. People like them for their style and support. They also like that the sleeves warm their knees up quickly. Many people who had knee surgery and struggled to exercise were able to do so again when wearing these sleeves. These sleeves slide up and down easier than others. Many people have struggled to get other sleeves on. People who do CrossFit, run, weightlift, and more all say that the Rockport knee sleeves work well. Their positions are better, they feel stronger, and that their knees feel secure. People have complained that the size chart isn’t as accurate as Rocktape thinks it is. Many people ended up going with a size smaller. This could be user error or it could be the size chart. It appears that some people had a hard time getting the sleeves on and off. With others having an easy time doing it, we think it may just be a personal preference. Many different professional reviewers are fans of Rocktape knee sleeves. Many of them used them with their workouts and echo the love of the support and style. They also feel that they are a great deal, especially getting 2 instead of one. They highlight the fact that these sleeves are longer than every other sleeve. This is especially good for weight lifters because the sleeve encompasses the entire joint and then some. This also helps you keep proper position while you lift weights. There are other knee sleeves that are either just as good or better. Whether it’s through strength, durability, or sizing. There are also a lot of cheaper knee sleeves that work just as good as Rocktape. Overall, many people feel that Rocktape is one of the best brands out there for people who are serious about working out. 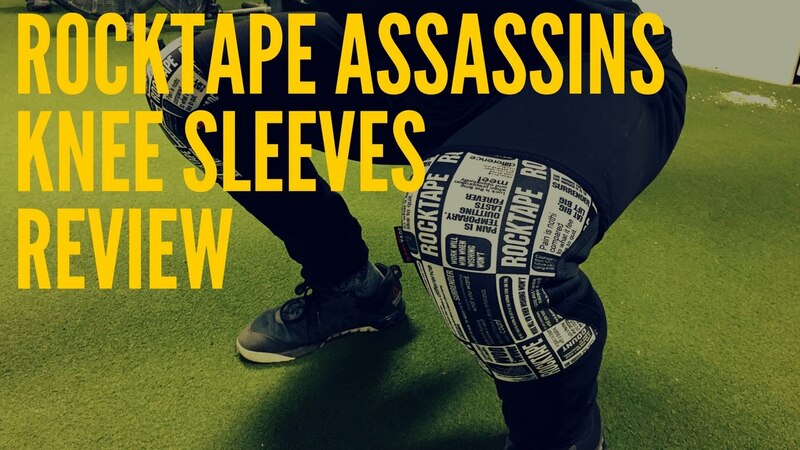 We agree that these sleeves are great for people who are very serious about their workouts. They are sturdy, supportive, and great for correcting balance. The fact that they have a flair for style makes them stand out from other brands. Of course, knee sleeves are more about how they work than how they look. It doesn’t hurt though, to have something you like and brings a smile to your face. Durability does seem to be an issue, but apparently, the latest version of the Assassins has gotten more durable. So, we will have to wait and see if they hold up. 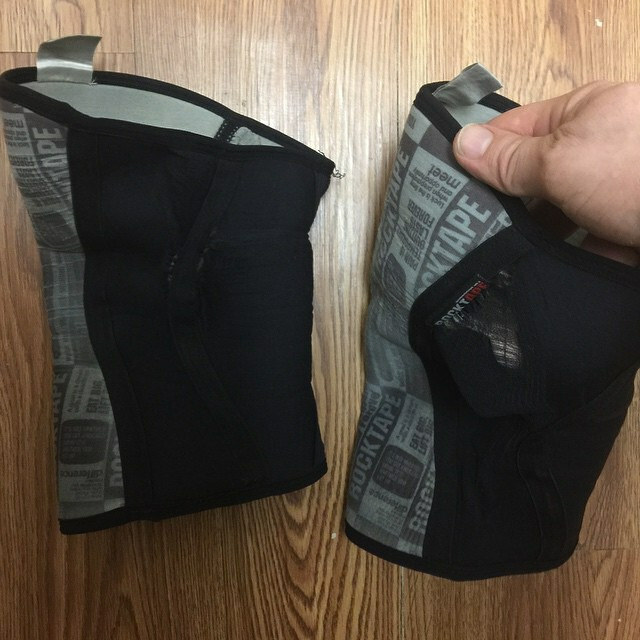 Knee sleeves, no matter the brand, will eventually fall apart if you do heavy workouts and don’t properly care for them. Even though some people felt the sizing chart wasn’t correct, it’s still good to look at it and measure your knees. You can choose to listen to the reviews that say to go down a size or go by your measurements. Overall, Rocktape is a good brand for athlete care. They care about athletes and want to make the best products to protect them. The price, while pricey for someone new to working out, is a deal for those who are serious about it. Their great customer service will help you with any of your needs or questions.